Hi guys i was looking to get a rod and reel for some spining and mackerel feather usage. Any recomendations. What I'm using at the moment is a two and three quarter test curve carp rod with a 4500 size reel loaded with 30lb braid and 15ft of 30lb nylon leader for mackerel with 2oz lead and four feathers. For spinning I change the leader to 15ft 20lb fluorocarbon. Nice and light to use all day and won't over power the fish. I would suggest a lightish bass rod, 1 to 3 oz should be OK, if you are shore or rock fishing. 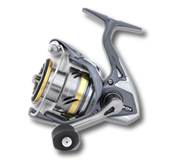 Which one depends on the budget you re thinking of for the rod but there are several around. There are number of spinning rods as well, I use a Daiwa Wilderness but that is a 6 piece travel rod but does well for what you require as that was why I bought it. If you go for a spinning rod get one for a reasonable weight as they are not a saltwater rod and the sea is a harder environment then freshwater. Perhaps a pike/predator spinning rod.